Welcome and Happy Wednesday! I think we have finally turned the corner and Spring is officially here! You know that’s true when the boaters are out and the trees are about to burst open! What’s blooming at Happy Hill? LOTS! Spring is absolutely my favorite season! (Other than the pollen of course.) But the pollen is necessary for Mother Nature to work her magic. So, I take an allergy pill and I’m good to go! Our lake house is almost 50 years old so I’m guessing that most of the trees and shrubs are MUCH older than that! And the azaleas are always show stoppers! The weather this year has been so unpredictable so that, along with the late frost, I feared for the blooms. But they don’t seem to have been affected, which is wonderful! They are just starting to bloom so in about another week or two they will be gorgeous! 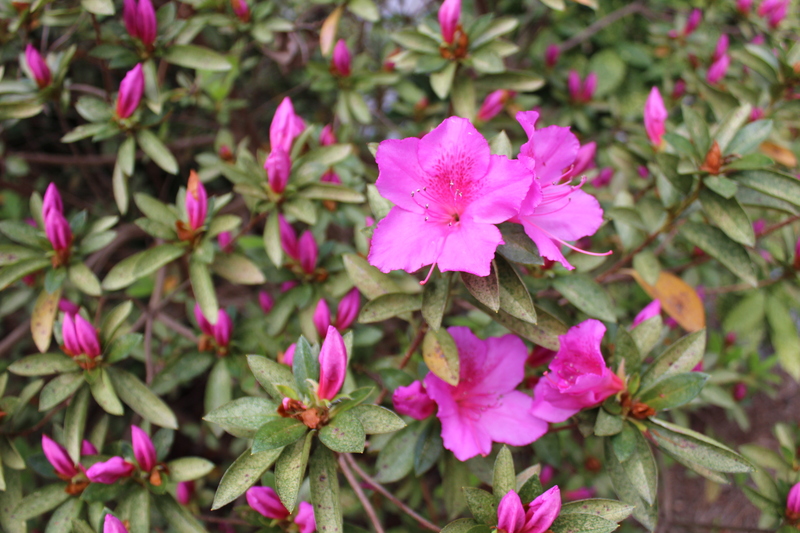 Azaleas come in so many colors and I think we probably have at least one in every color our property! But pink is always my favorite. This is the cluster of azaleas last year in full bloom. They are planted around a few large trees and it always looks so pretty from the lake when they are in full bloom. Every year right after the azaleas bloom, we trim them back and fertilize them with Holly Tone. This keeps them from getting too leggy and ensures plenty of beautiful blooms next year. We have several dogwood trees on the property too. Unfortunately we’ve lost a few of them due to a blight of some sort but the few that still remain are so pretty! There are a few random daffodils that pop up every year. They are so sweet. We also have some huge blueberry bushes. Sadly the birds and animals usually beat us to them but one year we got a few and they were delicious! I even froze some for pancakes. Fingers crossed this year for a bumper crop! I’d love to plant some forsythia bushes and some rose bushes at the lake soon. You can never have too many flowers, right?